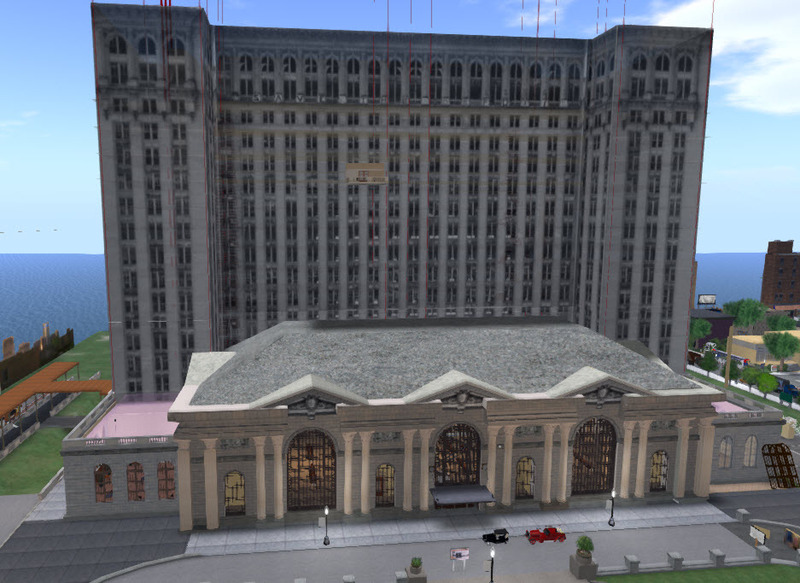 The 3dcolab.com crew has built a simulation of the historic Michigan Central Station, a railway depot which is one of the best known iconic ruins of Detroit. We showed our magnificant as it used-to-be re-creation last month at the Detroit Design Festival dElectricity event. The location was a friendly art gallery and coffee shop. We had two computers. One was set up using David Rowe’s CtrlAltStudio viewer for people to take turns viewing through the Oculus Rift headset. We had a real life staff person to help this user and to reset this avatar in a good starting position for each new user. Next to this we had the second machine and a second real life staff person logged on with the normal Firestorm viewer. This was used to control a second avatar functioning as a tour guide for the Oculus Rift user. We projected this tour guide screen on the wall of the gallery so that people waiting in line could see what the two avatars were doing. We also had the rest of our crew in world. They were seen finishing up some of the build as a demonstration of real time collaborative building. 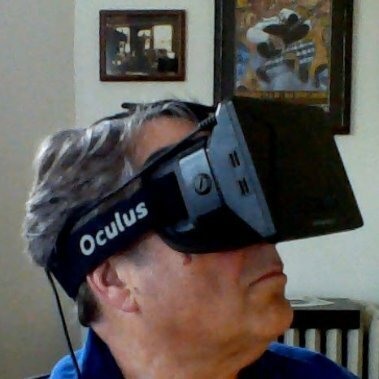 Paul Emery wearing the Oculus Rift. 1. Scenes that can take advantage of the positional tracking of the head. For example, not only can the avatar walk up to a railing to look out, but if the user leans forward and looks down, their avatar will respond by leaning over and looking down over the railing. Similarly, the avatar can look around a column or bend down to look under a table. Actions like jumping off the ledge or looking out from some hiding place become much more realistic. 2. Scenes that allow up-close “personal” looks at details. For example, when a user has the Oculus Rift on and moves the avatar up to a table, an automatic response of the user is to try and reach out in real life to feel the table. In comparison to the usual avatar view of a scene, what is right in front of the user is more significant – it “feels” closer to you and more personal. The close up details will be experienced much more powerfully with the Oculus Rift. You can look down and see your feet. 1. 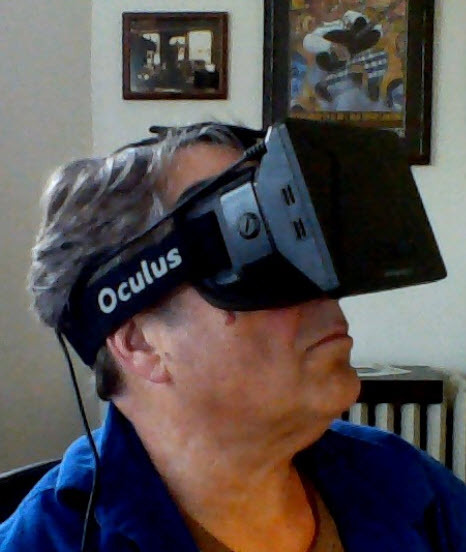 Navigation for a newbie is hard and with the Oculus Rift on is harder. Make sure doorways and passage ways are wide and stairs have a railing. 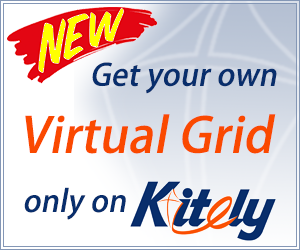 2 Be aware that using the mouse cursor is sometimes a problem with the CtrlAltStudio viewer. Because the rift view is an extension of the screen, the mouse cursor can get lost on the non-Rift section of the extended screen. As a result, even though the interface it there, it can be hard for a user to click in the correct spot on the screen. To start and stop flying can be difficult. So if you want to show off something with a birds-eye or scenic view try to set it so the avatar can walk to the view station. 3. In general with the headset on, the Rift user can’t conveniently use either the mouse or the keyboard. 4. Try using a collision event rather then clicking on an object to cause something to happen. 5. Try a joy stick for movement. 6. Instead of using the arrow keys to move, leave the Movement Hud in the center of the screen and use it and mouse clicks to move. 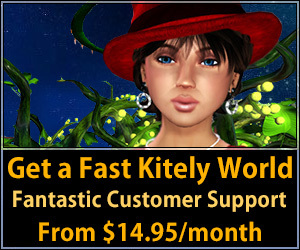 Interaction with other avatars is a key value of the OpenSim multiuser experience but unfortunately keyboard text chat ain’t happening with the Oculus Rift so start using a audio headset and voice on your sim. 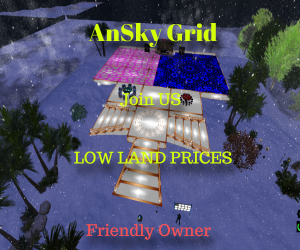 This was, over all, quite a successful event, but be aware, even though you sweated blood doing the build, people were much more excited about the fact of the “3D Rift experience” than the simulation itself. Paul Emery is a co-founder of Detroit-based 3Dcolab, which builds immersive 3D and avatar-based simulations. He is known in-world as Casias Falta. 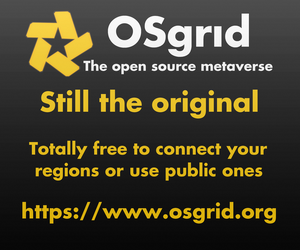 The virtual Detroit MCS sim can be reached by hypergrid at 3dcolab.com:9015. The company also hosts virtual Belfast, site of the popular live in-world music venue the Maritime Club.